Two Bears Farm and the Three Cubs: 400 Followers Appreciation Giveaway! Hey folks! I'm super excited to have reached 400 followers last week, so I wanted to give away some fun pampering items in appreciation. 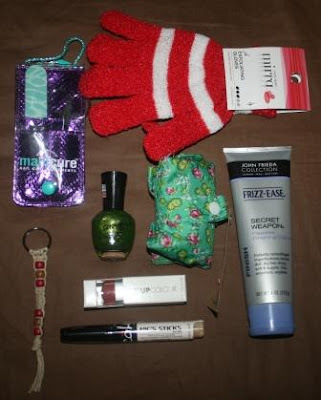 So one lucky person will receive a travel manicure set, an exfoliating glove, a hand made (by me!) beaded keychain lanyard, green nailpolish (I have this exact color myself - I know it's a little crazy but green toes are fun in the summer! ), a reusable floral patterned eco-friendly shopping tote that compresses from Old Navy, John Frieda's Secret Weapon (to help your hair survive the humidity), Opi lipstick in a neutral rose tone (Color: Who Comes Up With These Names), and Nicole nic sticks in a neutral beige (Color: Stick With Me). To enter you must be a follower, and you must leave a comment. That's it! Make sure you leave your email if it isn't visible in your profile. Winner will be chosen by Random.org on August 2 at noon, and I'll ship anywhere. Winner must respond in 48 hours. Good luck! Also, thanks to everyone who entered the Loveable Labels giveaway. The winner was Meghan from Edible Madness. awesome idea! congrats on the 400 mark. After working in the yards,gardens,pulling weeds,mowing,and try and keep the house in order,I NEED A MANICURE!!! I sure hope I win,O' random generator pick me!pick me! teehehehe. WOW!...400!...so happy to be counted in as a follower of your sweet blog! Well that is a cool give away,enter me please! What a wonderful prize! Congrats on your followers! I can't imagine 400 followers, but I'm not surprised . I thought I was already a follower, but realized I wasn't. I am now. What a nice gift. But living her in Canada I don't like to enter-postage is way too much. But I know some lucky winner will love the goods! Love the green nail polish! Congrats on the big 400. You're fun, and you picked some fun things! Of course I'm a follower! I actually do use that Frizz cream. Can't believe you have 400 followers! I like the Old Navy shopping tote. Congrats on the followers! Fantastic! FUN!!!! I am loving the little manicure set and the lanyard you made!! Also the green nail polish, I use all colors! I'm keeping my fingers crossed! Hey, I'm having a giveaway tomorrow!!! Be sure to enter if it looks good to you! I'd be interestd to try that green nail polish! yay! thank you! and congrats on all your followers! Well, if I win, my frizzy hair will thank you! 400 - now that IS something to celebrate. Congratulations! Congrats, Lisa.... You have such a great blog --so I understand why people follow you!!!! I don't participate in awards or giveaways or tags anymore --so please don't enter my name... Looks like a nice giveaway though..
Congratulations on hitting the big 400 mark! I enjoy reading your posts. It's always nice to meet another border collie owner! No makeup for me, Lisa -- I'll let another lucky lady win this time. But it is a very generous giveaway. Congrats on your 400 followers. Well deserved. How fun! Awesome that you reached 400!! Holy cow! I'm a follower :). Congrats on 400!! Have a Tiggeriffic Day~! ta ta for now~! Congrats on the 400 mark! I am a follower. Congratulations on hitting the 400 followers mark Lisa! Wow! Yes, please enter me in your giveaway! You know I'm a follower! That is so awesome for you! I would love to win a prize...I'm a follower. Thanks for stopping by my blog. Yay for 400!!! Yay for giveaways!! !